Who says you can’t just spend your graduate school savings to produce a film to help save our species? 26-year-old CEO & Producer Aakanaash Pothuktuchi did, and his upcoming feature film Sedition will make history with a revolutionary approach to storytelling, business and activism. 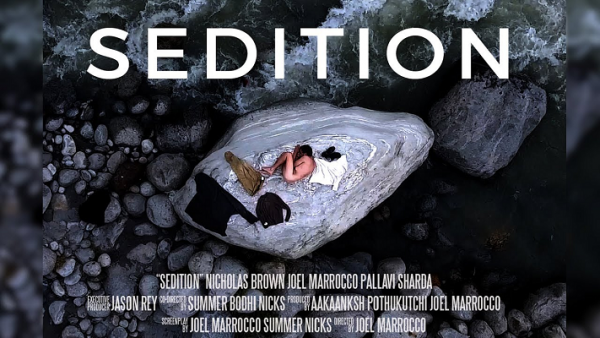 In a world where the film industry centers around Hollywood and celebrity worship, Sedition is a declaration of a new standard in cinematic storytelling targeted directly to Millennials who hear the call of actually giving a sh*t about the planet we live on. Its story follows the journey of a CIA whistleblower who comes to India seeking asylum after releasing a series of videos which showcase illegal U.S. government drone strikes on a school in Yemen, traversing through the Himalayan mountains and the border of China. With the use of drone technology the film captures hauntingly luscious cinematography to reawaken our primal humility and spiritual awareness about Mother Earth. Having studied business at Babson College, the top university for Entrepreneurship in the U.S, Aakaanksh found himself like many other disillusioned Millennial graduates: confused, depressed and seeking more in life beyond society’s expectations of a 9-5, 2.2 kids and a house. Through a series of synchronicities during a spiritual 18-month long backpacking journey across his home country India, Aakaanksh connected with filmmakers Summer Nicks and Joel Marrocco. During his travels he met Western Yogi travelers which made him recognize how deeply unhappy people in the West and around the world are on a spiritual level. Such insights and revelations during his journey helped him come to terms with his own purpose and calling. Together Aakaansh, Summer Nicks and Joel Marrocco developed an indie production team to film across some of the most breathtaking sites throughout the Himalayas; with over 60% of filming already done, their team is now in midst of a fundraising campaign to raise money to finish filming. But beyond money, their campaign is a call-out to Millennials about how to use the power of their money as our vote. Instead of simply paying to be entertained, Sedition offers us the opportunity to make a tangible difference in the world: one tree and one child at a time. As more of us sense the visceral truth of what many of our ancestors called Kali Yuga, the End Times, the Fourth World, etc. Many of us are asking ourselves how willing are we truly to a build hospitable world for ourselves, our children and our grandchildren to actually live in? To Aakaansh, the answer is clear in a time in human history where humans are eating away at our own life support systems. It is about creating a business model that leverages the power of storytelling and profit to plant seeds back into the earth and in the minds of the next generation of changemakers. A story that unites us as a generation to recognize that the survival of our future children and our planet depend on us to live courageously and creatively. Watch the trailer below and make sure to check out and donate to his campaign!
? Fool-Proof Ways To Spot A Liar, As Explained By A Certified Fraud Examiner FEMA Contractor Failed To Deliver Millions Of Meals To Puerto Rico ?